Description of "Machines for Small Business (eBook)"
his is a complete guide book for those who wants to setup a small manufacturing unit. 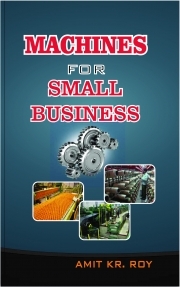 In this book you will get lots of manufacturing business ideas , how to plan a business , about demand of the product in market, availability of raw material at cheaper price, availability of machines. Following are some the content of this book. Reviews of "Machines for Small Business (eBook)"